Hello…$.10 a sprig. Not too bad for this rosemary lover with no rosemary plant of her own! So Tyler and I stopped. 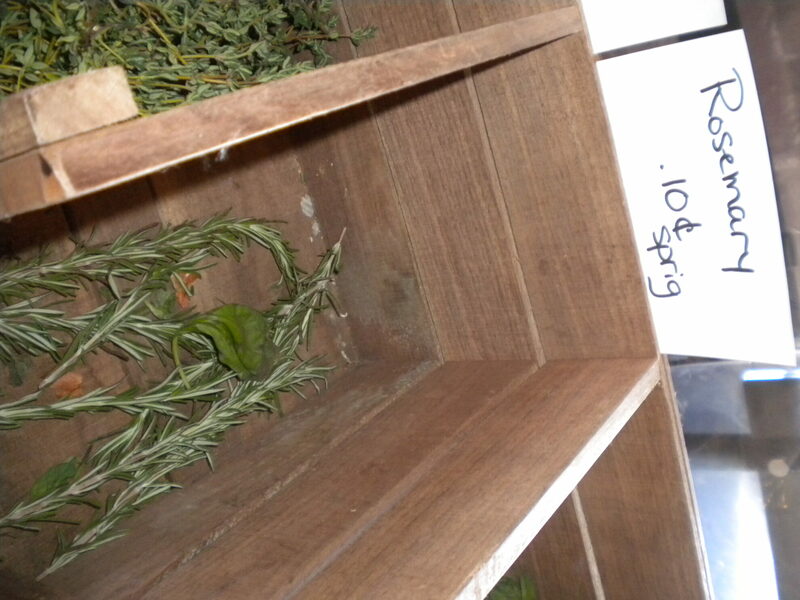 To get a few sprigs of rosemary. I kept browsing along and found these perfect little red potatoes. I knew just what I would do with them, as I had just been browsing the Smuckers recipe booklet. I’ve always boiled potatoes when making potato salad. But not anymore! Their Roasted Potato Salad inspired me. The Rosemary inspired me. If you like rosemary, this is a MUST try! 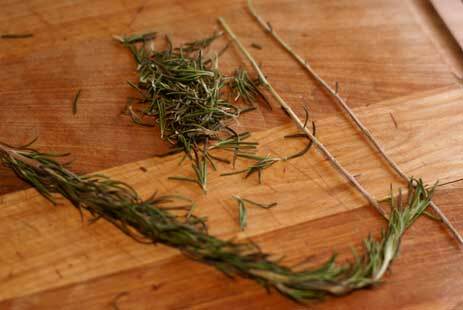 Using your fingers, pull off the rosemary leaves by sliding and pinching your fingers down the sprig. Chop the rosemary leaves. 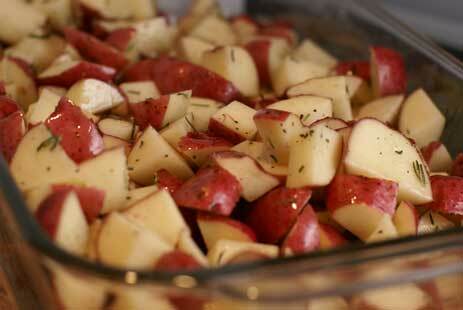 Add the diced potatoes to a baking dish. Sprinkle with salt and pepper and some of the chopped rosemary. (You’ll need more rosemary for the sauce.) Drizzle some olive oil over the top. Toss in the baking dish. 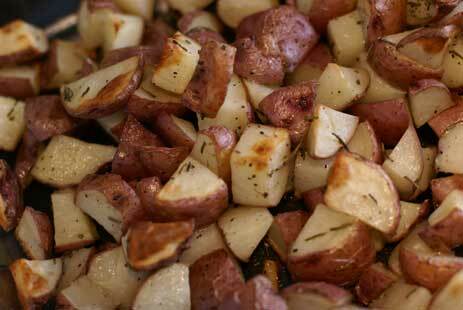 Roast the potatoes at 400 for 25-35 minutes, or until softened. 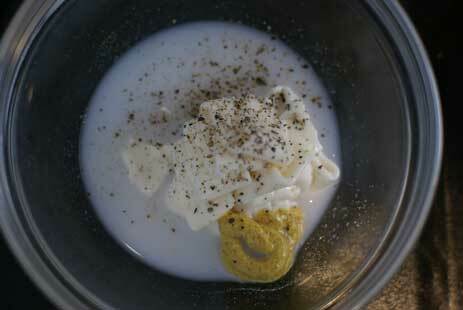 In a small bowl, add the mayonnaise, milk, Dijon mustard, salt and pepper. Whisk and then add the remaining chopped rosemary leaves. 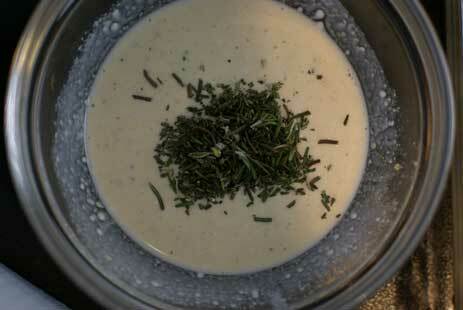 Mix in the rosemary. 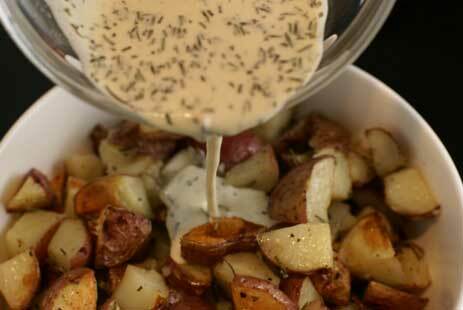 Pour the sauce over the roasted potatoes. Toss the sauce with the potatoes. 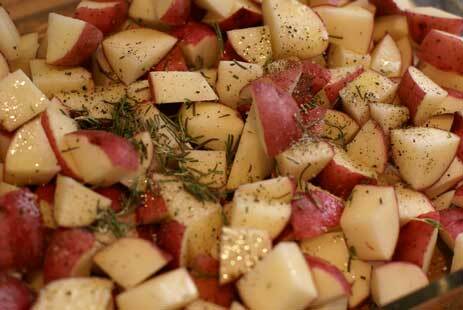 Serve Roasted Red Potato Salad warm…or chill for at least 2 hours and serve cold. I love to “roast” little red potatoes skewered thru with rosemary branches. This looks AMAZING. 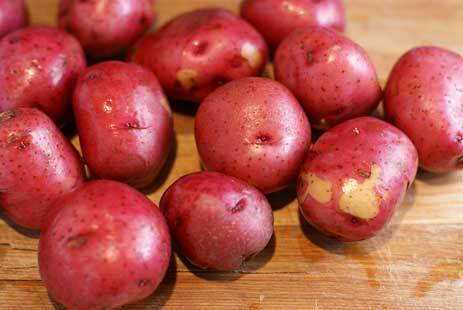 I absolutely love the red potatoes. Oh and to have them roasted, too is a double bonus. I’m going to try this one! Oh my! I can’t wait to give this a try. We planted Rosemary in our herb garden last year, and something, still unknown, came and stole it. There were no traces of anything, anywhere. We’re going to try it again this year–hopefully with better luck! I do steps 1-5 with sweet potatoes and love it! I add a little sea salt as well! One of my faves! 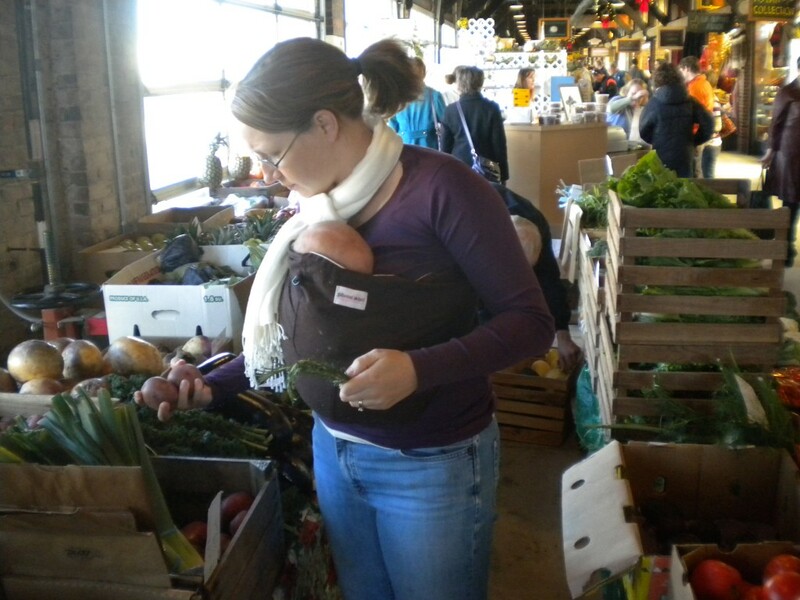 Off topic but what kind of baby carrier is that? I have my second due in April and am trying to pick out something to put him in while I chase after my 2 year old. I promise I will not make a comment on your next post, but I too LOVE rosemary and have a ginormous rosemary plant right outside my front door. I planted mine about 4 years ago and it has just taken off. Is it too cold there for your rosemary plant to not make it through the winter? Mine’s just planted in the flowerbed in the front of my house and takes NO care whatsoever. Also, several years ago when my husband and I were in San Diego, CA we went to dinner with friends at a local eatery, The Hash House. Their signature is to put a HUGE stalk of rosemary sticking out of each of their entrees. If you get a doggy bag (and you definately need one there), they put another HUGE stalk of rosemary sticking out of the bag!! I love rosemary! My husband just bought me my very own bush. I can’t wait to try out this recipe. This looks so good. 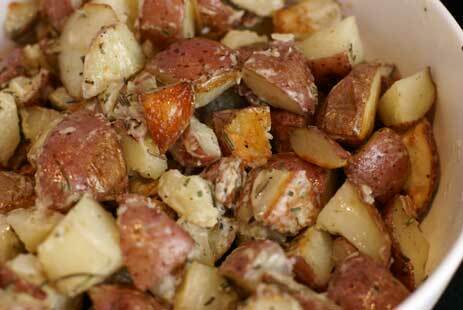 I am going to try making it tomorrow and I just happen to have some red potatoes. Thanks. Just curious — do you cover the potatoes when you bake them? This looks so delish!!! I have a little thing for rosemary, myself. Which way did you like better, hot or cold? That’s a great idea! 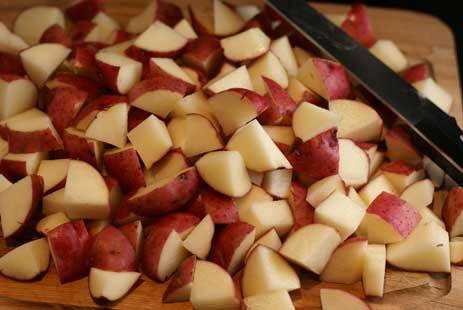 I usually make potatoes that way but as a side dish. The only thing I do different is cover them with parmesan cheese before I cook them and dont add the mayo, mustard or milk. Their yummy that way too. Thank you! I had red potatoes on our menu for tomorrow but now I can have them again later cold too!!! That is so funny that you posted about Rosemary taters. I just posted a similar thing on my blog! I think great minds think alike. Well anyways, I love your blog and your recipes! Thanks for helping to feed my family! MMMMMMYUM! I have to tell you about this little piece of neighborhood in our town.. in the area is a community garden, I’m not sure who gets to use it. However, the group also took over the planted medians down the strip of street right there near the garden. This little street is just a way-back residential street, not busy, not noticed. Guess what grows, in HUGE bushes, ALL ALONG THE ENTIRE STREET? Yep… Rosemary!!! In abundance and free for the taking! My girls and I snip some now and then (It can last a long time), and sometimes we just stop to smell the bushes! Isn’t that GREAT?? I’ve heard of commando garden people that go around cities planting veggies, herbs and other things in empty/dry/dead areas of town!! Their little secret! LOL, thanks for the post, I’m so drooling over these potatoes! 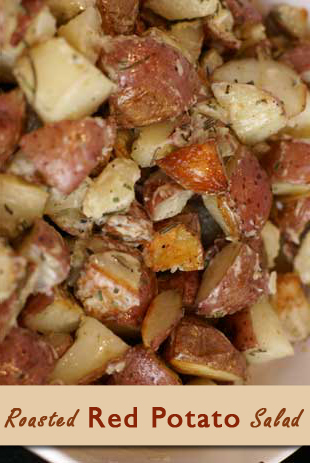 I love making red roasted potatoes…thanks for this recipe. I’ve never thought to add a sauce to them and turn them into a potato salad. your recipes sound great!!!! A friend of mine did your red potatoe salad…….he flipped-out. Told me as soon as he did it.Then posted your link on my facebook page…… OK…..SUBMIT ME NOW!!!!!!! This is a delicious side dish hot or cold! I happened to have some white onion and garlic in my pantry so I decided to roast the red potatoes with a clove of minced garlic and add chopped raw onion to the mix. It really enhanced the flavor of the potatoes and rosemary. Yum! Next time I will try adding hard boiled egg and see what happens.